Vietnamese site Tinhte (link currently down) claims to have gotten its hands on some advanced screenshots of BB10, which is expected to launch at the end of next month. For the revamped operating system, it looks like RIM has taken pieces from Apple, Google, and Microsoft competitors and jammed them together. It's the best looking thing RIM has ever done, but sadly, it still doesn't look very good. First, a disclaimer: These are supposed leaks that we can't verify, but, based on what we've seen from an offical video before, these are totally believable screenshots of the forthcoming OS. The overall UI is pretty conservative, which isn't terrible considering the prototypical BlackBerry user needs something easy to use. The homescreen and pull down menus look like a direct descendent of Samsung's TouchWiz skin for Android. The icon design is pretty horrendous. What's up with the shadowing behind the icons and why is the LinkedIn Foursquare icon bigger than the others? Hopefully that dimension within the icon will be standardized for the final version. The skeuomorphic page flapping in the wind on the calendar icon doesn't bode well either. Also, please tell us which enterprise Blackberry client is going to enjoy an app called story maker. Here we see what appears to be some kind of voice search application. A Siri for Blackberry perhaps. The boxy design of those dialogues sure reminds us of Windows Phone, but that square microphone button at the button doesn't quite do it for us. Maybe RIM is just trying to avoid getting sued by Apple over the design of the Siri mic button. 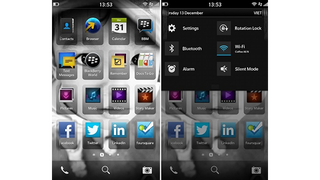 Blackberry Hub is the central messaging system for BB10. Hard to judge from what we see here. But then, it's a little worrisome that we can't tell what's going on from a graphical UI standpoint by glancing at it either. It all looks very redundant. Mercifully, Twitter and Facebook look more or less the way they do on other mobile operating systems. We'll see what RIM shows us when BB10 is officially launch on January 30 in NYC.